Your roof represents a considerable investment in time and money. For that reason, it isn’t easy to just decide to replace it. How do you tell when a repair job will cover things and when you need to go for a full replacement? Tedrick’s Roofing looks at four things that will help you decide which route to take. 1. Repair minor damage to a small area of your roof. When the damaged portion of your roof remains focused in a small area, it is safe to go for repairs. A busted tile, a cracked shingle, or even a leak problem will not require a full replacement. To protect your roofing in Kent, WA, however, we recommend a thorough inspection to spot potential trouble spots. 2. Replace major damage to wider areas of your roof. It is a different story when the damage and problem areas span a greater portion of your roof, if not the whole roof itself. 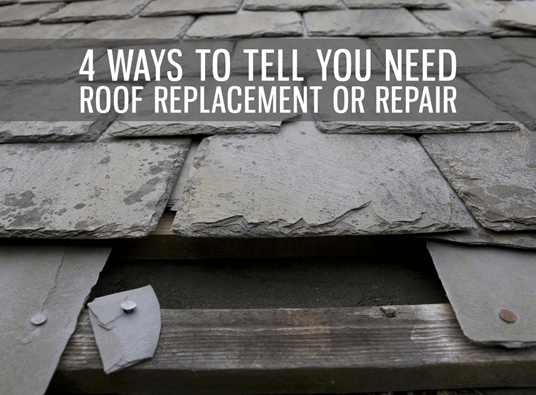 From holes in the roof to subtle water damage, you need to check different areas of the home. In these cases, the best course is to go for sturdier materials. Be sure to check the underlying supports for damage. 3. Repair in an emergency. In cases where damage to the roof happens due to the weather or any other emergency event, consult Tedrick’s Roofing. As the top roofing contractor in Auburn, we will make sure that problems like leaks do not spread and worsen. We offer 24-hours coverage should you need us, and are quick to respond to wind and storm damage. 4. Replace when it simply is time. Another good case for replacement comes when your roof simply nears the end of its service life. The average lifespan of any roof is 20 to 25 years. If your roof is nearing or well into this timeframe, Tedrick’s Roofing will be happy to check for deterioration brought about by the years. Whether you go for a repair or a replacement, Tedrick’s Roofing has you covered. We offer a range of repair services including emergency quick fixes. We also carry some of the best modern roofing options available including metal, slate, and wood shakes. We even carry products from great brands like GAF, CertainTeed, and Owens Corning. Call us today at (877) 212-9355 for more details.